We are a leading Manufacturer of boring cartridges from Chennai, India. 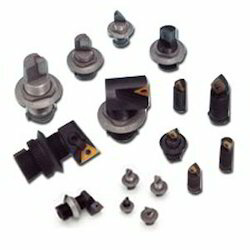 Our firm specializes in offering an excellent range of Boring Cartridges. To maintain industry set standards, these boring cartridges are manufactured using superior quality raw material and contemporary technology. The offered boring cartridges are examined by quality experts on various parameters in order to ensure their quality. In line with industry standard, we provide these boring cartridges in different sizes and specifications at market leading prices. Looking for Boring Cartridges ?